Knitographical: Meet Barnaby - an unclaimed hat! Meet Barnaby - an unclaimed hat! Today I would like to introduce you to Barnaby. Barnaby is a hat without a home - an owner-less hat so to speak. But don't feel sorry for Barnaby. It's just that he hasn't met the right person who is willing to love him, possibly pay money for him and take him home and wear him and appreciate his awesomeness. So why am I knitting owner-less hats. Well it's all the eldest daughter's fault (she's the gorgeous hat model above demonstrating Barnaby's finest points). About a month a ago, we went and met her at her house in Melbourne and spent a chilly Sunday morning wandering around an eclectic Sunday Market whose chief specialty is second hand and vintage clothing. We were looking at what was on sale and what the young hispters were wearing and she turned to me and said, "Hats! You should knit some hats and we'll come here, get a stall and sell them. Your hats are so much cooler that ones around for sale here. My housemates keep trying to borrow mine and would pay for you to make some for them". And so the seed of an idea was born. I'd knit a stockpile of hats and we'd sell them (somehow). So here is the first of the stockpile. I've long wanted to knit this one. It was a chance to try a new starting technique for knitting in the round. 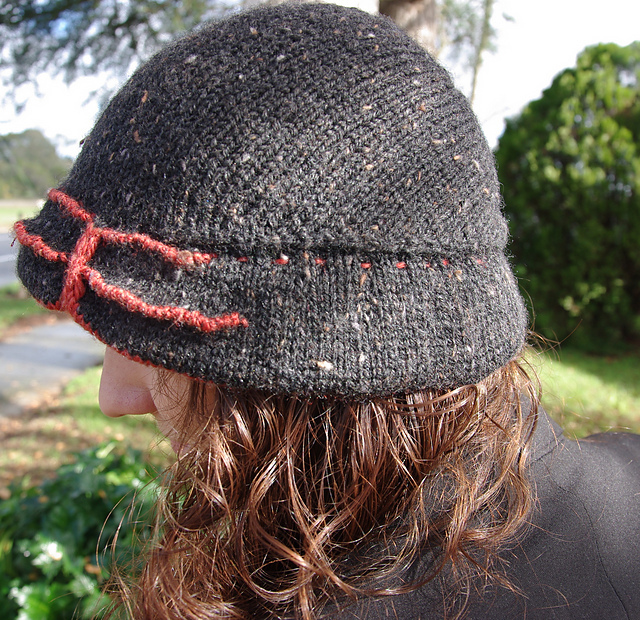 This hat is knitted top down beginning with an i-cord 'stalk'. It was a really interesting exercise in hat construction. It's not really either of my daughter's thing though. However, the 1920's is in in a big way, Baz Luhrmanns The Great Gatsby has just been released and I figure Barnaby's time has come. It's time for him to be both fashionable and warm. So why is this hat called Barnaby? I was adding it to my completed projects on Ravelry and I was stumped for a name to call it. So I asked the middle daughter. "Barnaby! ", she yells randomly from the depths of her couch huddle of blankie and computer. As so Barnaby the cloche was duly christened. Detail of the back showing the starting stalk and lace eyelet shaping. So if Barnaby has caught your eye and you're dying to own him, drop us a comment and we'll discuss price. Otherwise he gets to hang for a while until he has enough mates to make this a worthwhile venture. (This may take a while as the kids keep falling in love which the various hats I am making for the stockpile and acquiring them for their own wardrobes).